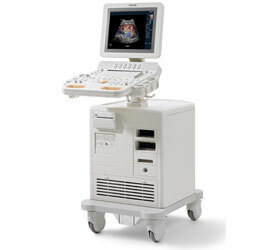 The Philips HD7XE ultrasound includes a full selection of transducers (sector, curved, and linear arrays), allowing a wide of clinical applications that include the basic, routine needs to more specialty needs. The HD7 XE has been replaced by the ClearVue 350 and ClearVue 550 ultrasound machines, which makes the HD7 XE a very good, affordable shared service ultrasound system. As with all Philips systems, a great amount of attention is given to producing outstanding image quality, which is definitely the case with the HD7 XE.